Some slots are too hot, other online slots just aren't hot enough and then there are slot machines that are just right. Quickspin's Goldilocks and the Wild Bears fits neatly into the latter category thanks to its endearing looks, accessible features and innovative take on wilds. The Goldilocks and the Wild Bears slot game doesn't go crazy with anything in particular (except maybe wild symbols) and that's a good thing for newbies out there. As you won't be overwhelmed by complex features, unclear images or challenging bonus rounds, you should find Goldilocks and the Wild Bears easy to play and endearingly enjoyable. We've compiled a Goldilocks and the Wild Bears slot review so you can see exactly why this is one of the best online spinners for newbies. 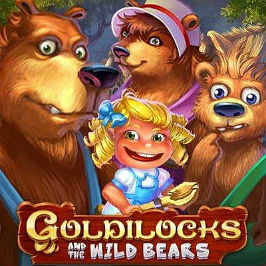 As its title suggests, the Goldilocks and the Wild Bears slot game is based on the classic children's story first recorded by Robert Southey. This theme is apparent throughout the game and that, rather unsurprisingly, makes it extremely impressive to look at. From the woodland backdrop to the quirky collection of bears spinning across five reels and 25 paylines, the Goldilocks and the Wild Bears slot game is certainly pleasing on the eye. 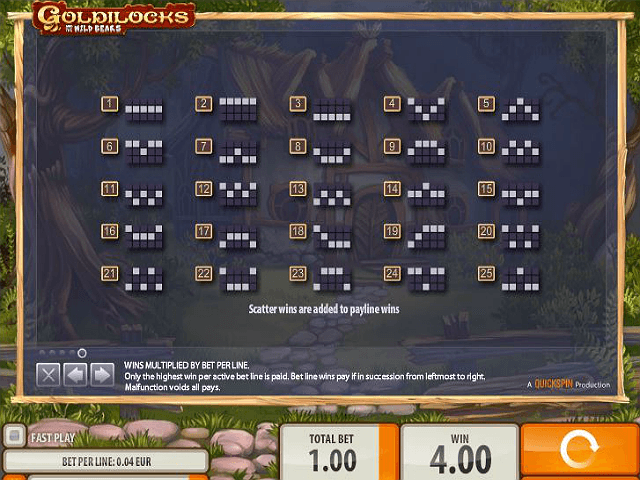 Another nice feature you'll find when you take a spin on Goldilocks and the Wild Bears slot is that the software provider has made betting extremely accessible. Instead of a small selection of bet denominations, you'll find two tabs listing a slew of different options. In terms of paylines, you can adjust the number options from one to 25 and for your bet size, the cash amounts range from 0.01 to 250. This level of specificity is fantastic and certainly makes it easier for players of all skill levels to find the right size bet for their bankroll. In fact, this combination of attractive looks and accessible betting limits is perhaps the biggest reason to give this game a spin. 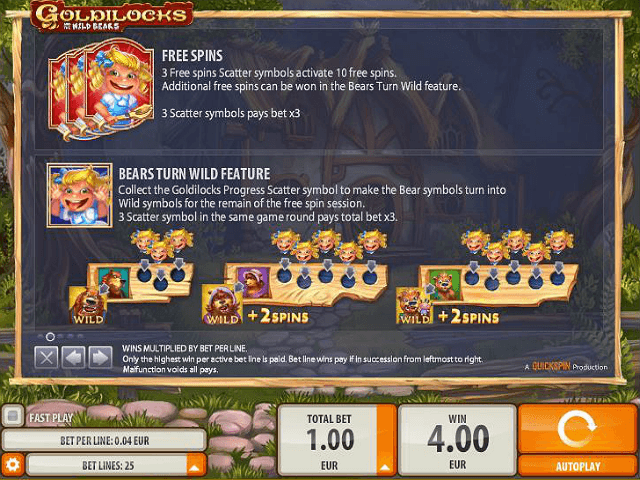 Aside from offering a welcoming interface and simple betting system, the Goldilocks and the Wild Bears slot game has one unique feature: crazy wilds. 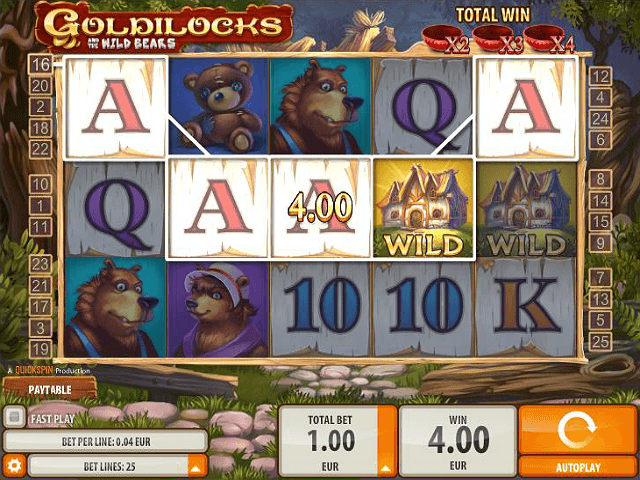 Unlike most online slots that use wilds as a way to create more winning combinations, Goldilocks and the Wild Bears takes things to a new level. Yes, it's true that the standard wild will substitute for all other symbols (except scatter) and pay out a top prize worth 1,000x your line bet when you roll in five. However, what you'll also find when you play this video slot is that wilds have multipliers attached to them. Known as the 'Porridge Multiplier', this bonus symbol acts as a regular wild but will also multiply your wins between 2x (one multiplier wild), 3x (two multiplier wilds) and 4x (three multiplier wilds). On top of this special symbol, three scatters will award you with a prize worth 3x your bet as well as ten free spins that, once again, make use of this game's unique wild feature. Basically, when you roll through your free spins, the Bears Gone Wild bonus will allow you to collect scatters as the reels turns. These scatters turn into wilds and stick in place, which means the more you collect, the more ways you have to win. Eventually, by the end of your free spins you should have a screen full of wilds and a pocketful of cash! 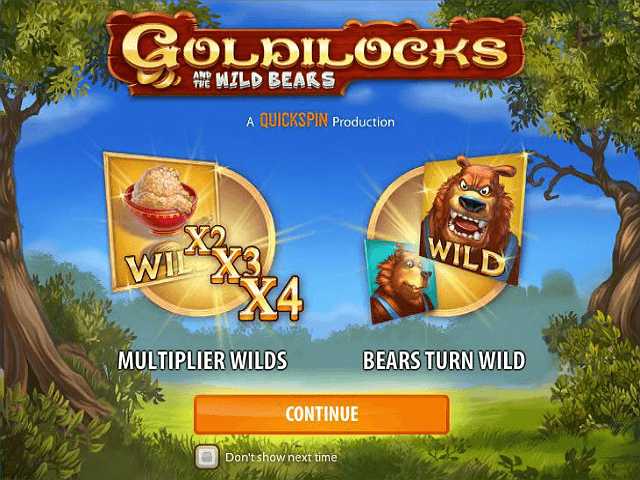 If you want to spin a slot that looks great, is simple to play and is dotted with interesting features, Goldilocks and the Wild Bears by Quickspin is just right. If you like Goldilocks and the Wild Bears - You'll like these slots too!